Perfect for daily wear, the Curvy Waist Training Underbust Corset is made of glossy PVC and is steel-boned for optimal support while waist training. The piece is shaped for the experienced waist trainer with wide bust and hips and a narrow waist. 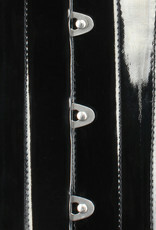 The garment has metal busk closures with single metal swing clasp closure in the front. There is also a 6 inch wide floating modesty panel in the back, as well as loops for garters around the bottom.